Holy Cow, as you know I am a big fan of Bon Iver and when I talk about James Vincent McMorrow, it is quite impossible not to mention Justin Vernon (Bon Iver). I’ve seen Bon Iver the first time live at Haldern Pop Festival 2009. And this year James Vincent McMorrow played at the festival. Sadly I wasn’t there but friends reported it was amazing, as every year. James Vincent McMorrow is a singer-songwriter from Dublin, Ireland. Soft guitar tunes, amazing voice, great lyrics. Similar to William Fitzsimmons, Sufjan Stevens or … Bon Iver. 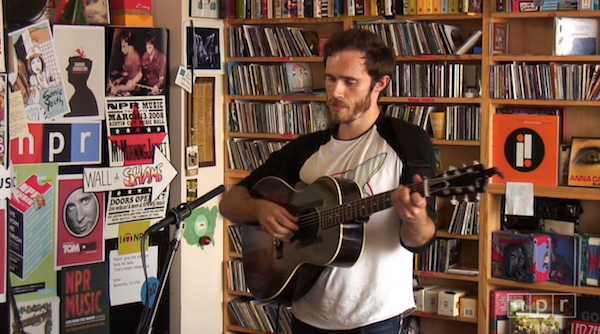 Watch this 15 minutes tiny desk concert of James Vincent McMorrow from NPR and decide yourself what you think. Oh, and on SoundCloud you can also find 3 songs of him. Damn is that good…. and by the way, perfect music for the very soon arriving Swedish autumn. Das Album Kostet nur 6,99 € im iTunes Store. Krass. @Martin Yeah! Freut mich, da hat sich das Posten ja jetzt schon gelohnt! Viel Spaß damit! Und einen interessanten OLiBa hatter.